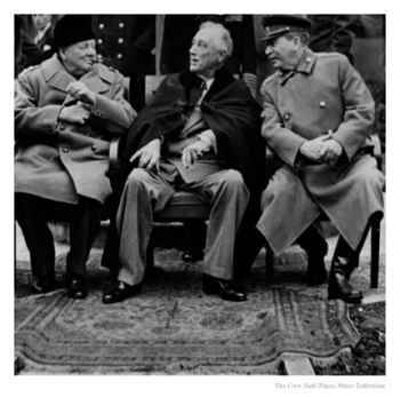 Churchill, Roosevelt, and Stalin — the Big Three. Churchill, Roosevelt, and Stalin—the leaders of the three major Allied powers—were known during World War II as the Big Three. The Big Three and their military advisers planned the strategy that defeated the Axis. Churchill and Roosevelt conferred frequently on overall strategy. Stalin directed the Soviet war effort but rarely consulted his allies. Roosevelt relied heavily on his military advisers, the Joint Chiefs of Staff. They consisted of General of the Army Henry H. Arnold, commanding general of the Army Air Forces; General of the Army George C. Marshall, chief of staff of the Army; Fleet Admiral Ernest J. King, chief of naval operations; and Fleet Admiral William D. Leahy, Roosevelt’s chief of staff. Churchill had a similar advisory body. 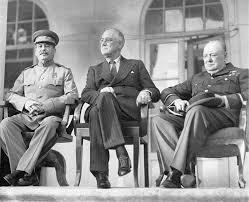 The main wartime disagreement among the Big Three concerned an Allied invasion of western Europe. 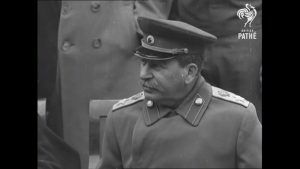 Stalin constantly urged Roosevelt and Churchill to open a second fighting front in western Europe and thus draw German troops from the Soviet front. Both Roosevelt and Churchill supported the idea but disagreed on where and when to invade. The Americans wanted to land in northern France as soon as possible. The British argued that an invasion of France before the Allies were fully prepared would be disastrous. Instead, Churchill favored invading Italy first. His view won out. Roosevelt and Churchill first met in August 1941 aboard ship off the coast of Newfoundland. They issued the Atlantic Charter, a statement of the postwar aims of the United States and the United Kingdom. After the Japanese attacked Pearl Harbor, Roosevelt and Churchill conferred in Washington, D.C. The two leaders felt that Germany was a nearer and a more dangerous enemy than Japan. They decided to concentrate on defeating Germany first. In January 1943, Roosevelt and Churchill met in Casablanca, Morocco. They agreed to invade the Mediterranean island of Sicily after driving the Germans and Italians from northern Africa. At the conference, Roosevelt announced that the Allies would accept only unconditional (complete) surrender from the Axis powers. Churchill supported him. Roosevelt and Churchill first met with Stalin in November 1943 in Teheran, Iran. The Big Three discussed plans for a joint British and American invasion of France in the spring of 1944. They did not meet again until Germany neared collapse. 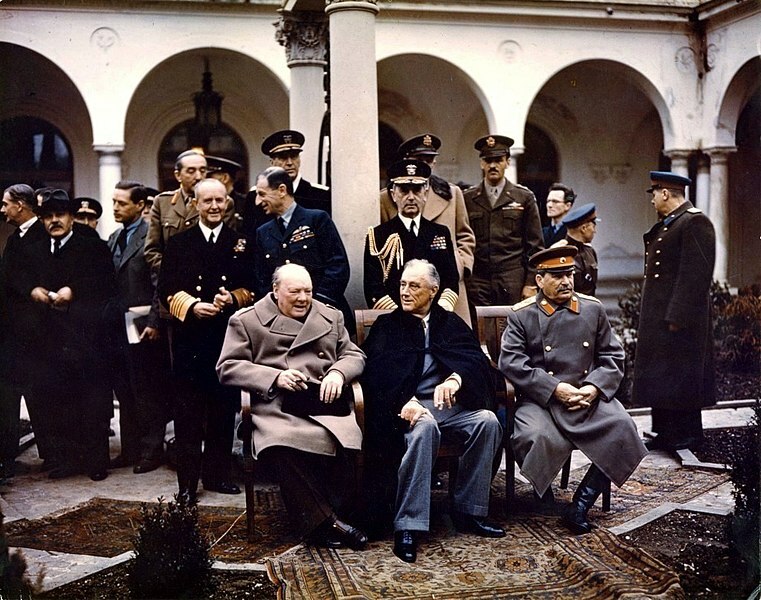 In February 1945, Roosevelt, Churchill, and Stalin gathered at Yalta, a Soviet city on the Crimean Peninsula. They agreed that their countries would each occupy a zone of Germany after the war. France was to occupy a fourth zone. At the Yalta Conference, Stalin pledged to permit free elections in Poland and other countries in eastern Europe after the war. He later broke that pledge. Roosevelt died in April 1945, two months after the Yalta Conference. The Treaty of Versailles, What Did the Big Three Want?